After thirteen years of owning Hudson River Valley Art Workshops and Fiber Art Workshops I decided to start painting and drawing. Chose a subject-this isn’t as easy as it sounds. You need either a live model and scene, or a really great picture. What makes a great picture or reference photo? For a photo I recommend printing it out on 8” x 11” high quality photo paper. I always print my reference photos in black and white and also in color. Much of the time, I use the image on my computer as a reference check as well. If you are using a live model, know the type of lighting and the direction of the light source. Plein air drawing and painting makes this tricky because the light quickly changes. Because of this I do either value studies or quick, painted sketches to capture the light and the figures as well as the landscape. I often take photographs to augment my studies. Next I decide which approach to use for a particular subject and scene. I use two different approaches: one – direct draw or some variant of it and two – guided draw or some variant of it. I haven’t completed many contour drawings. I find them rather tricky. Too much detail and everyone looks like the Michelin Man along with too little and cartoon like. 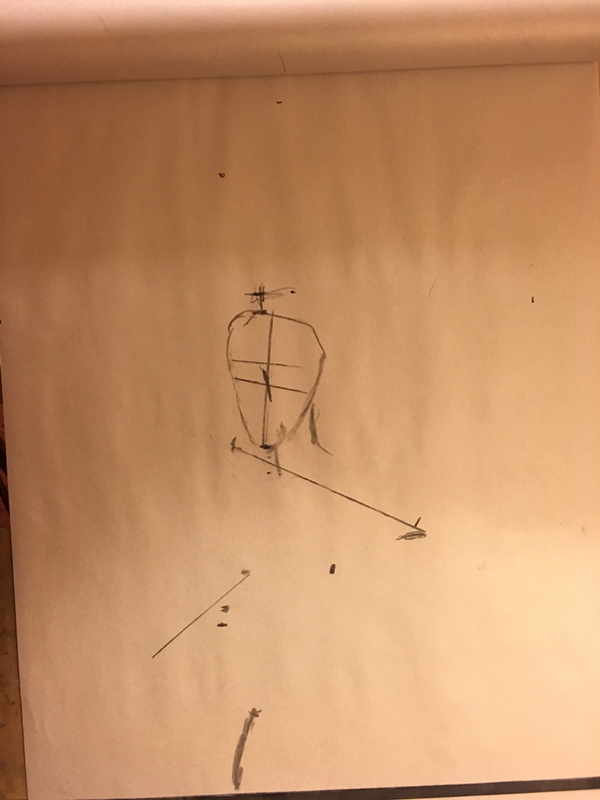 To start a drawing I determine what the gesture is and the feeling that is expressed as part of that gesture. Not just the gesture of the figure, but also how the figure relates to the environment he, she or they are in. I make sure that the gesture of the figure is reflected in the surroundings, whether landscape or interior. Once I completely understand the feelings and mood the model and environment are communicating—I capture that essence (via the model’s gesture) and exaggerated it. Mind you, I am setting a mood and not just drawing what I see in front of me. I’m drawing the feeling of the scene. A great way to capture the mood of a scene is by means of direct draw. A direct draw of a scene can be complex. Starting with the model—I don’t often start with the nose or some other feature on the face. My first inclination is to start with a promising curve, the leg or foot. Once I’ve drawn the model(s) to my satisfaction, I add in the surrounding scenery. Whether using direct drawing or direct painting, I like to completely finish the models before moving outward and onward from them. Direct draw or paint can be very satisfying and freeing. It allows you to put the most energy into your drawings or paintings. However, if the background is extremely complex, I sketch it in using vine charcoal to give me a framework in which to place the figures. I realize this is starting to look like a guided draw, perhaps it’s a hybrid. 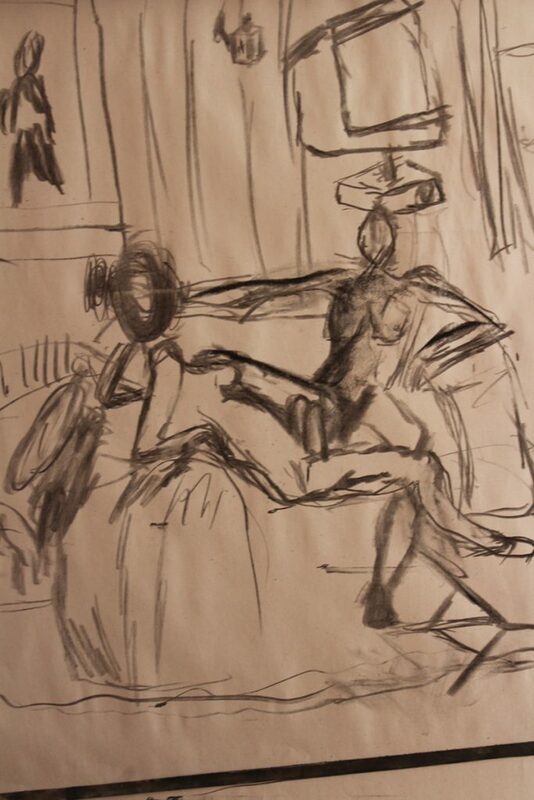 A quick sketch and freehand drawing of Rudy and Vera posing on the couch in the studio. This was drawn directly from live models. For me, guided drawing allows the best results. 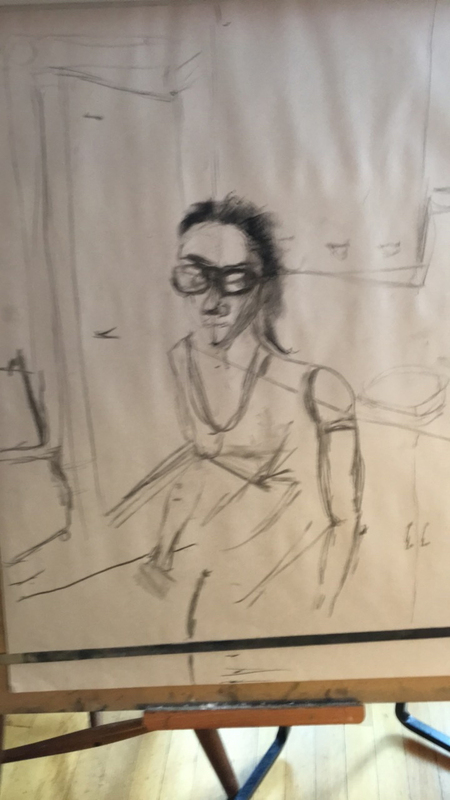 I have used two types of guided drawing, one where I put in vine charcoal guidelines purely by eye and the other where I measure the contours of my subject then put in measure marks and lines for the subject and background. This step takes a long time. I always measure the portrait in as much detail as I can and mark exact areas where the rest of the body and the items in a scene go. I use a ruler to mark the exact lengths and angles needed to create my drawing or painting. After I finish drawing guidelines, I block out the figure and scene using vine charcoal. I like vine charcoal for this — it is dark and can easily be erased. I capture the gesture, correcting my measured layout if necessary and exaggerating the gesture. And through the gesture, I capture the feeling, the mood of the figure and the whole scene. The very first thing I do is measure the figure in the reference photo and translate that onto my paper. 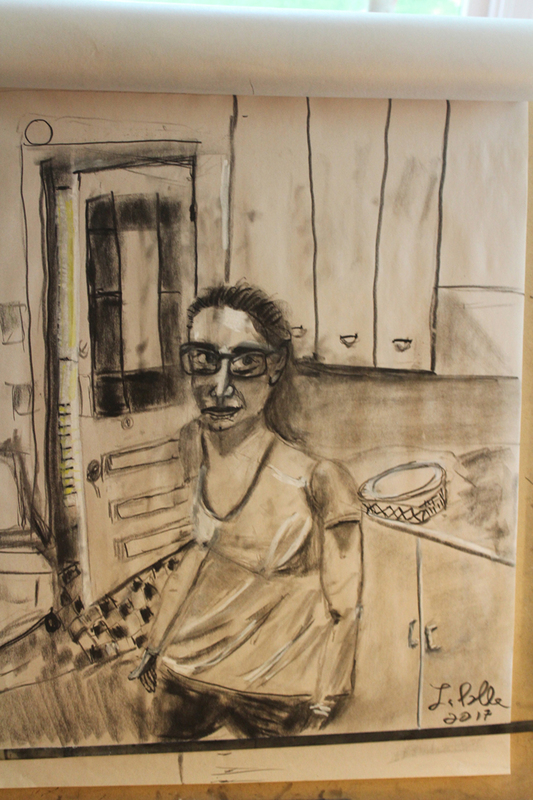 This was drawn from a reference photo of Sara in the Kitchen. If I am painting, I draw first with vine charcoal directly on the canvas, linen or board. I do not have a light touch with charcoal and like to incorporate the charcoal into my paintings, giving them an added, dark dimension. My next step, if painting, is to use a mixture of sepia to outline my drawing’s contours. Then I block in the larger shapes and finally use a smaller brush to paint in any and all details. If I am drawing, I like to gradually fill in the detail. I start with soft compressed charcoal for massing, a hard compressed charcoal for shadows, both body and cast. If needed, I add in contours with a soft 4B charcoal pencil, and put in finer details with a 2B. I erase as needed. The next step is to draw the initial drawing of the figure and some of the scene using vine charcoal, which is easily erasable. I then add specular reflections and defused reflections. I often use white or yellow pastel for this. It depends on the reflection. Specular reflections, such as reflections in a mirror or a piece of glass, do not need the pastel, because you are simply reflecting the image, but specular reflections where the light source itself is directly reflected, such as a lamp or the sun, can be nicely rendered using pastel. Lately, I’ve been using white charcoal for soft highlights. Then I add detail using both compressed charcoal and charcoal pencil. I add highlights using white pastel. I firm up the figure and the portrait as well as the rest of the scene. The final step is to sign the work and spray it with workable fixative. Defused reflection, where the light is not directly reflected back but is partially absorbed, is difficult to render because this reflection is what gives objects their color. In the case of charcoal, everything is either the color of the paper or black or grey. A lot can be done with the proper shading. Sometimes, I add in a touch of color to highlight a part of the drawing for dramatic effect, yellow pastel (or white charcoal) in the hair, white pastel for specular reflections of light sources or to show folds in fabrics. Folds in fabric create reflective surfaces and valleys of cast shadow. A great use of white pastel is to delineate folds. Finally, I add in the small details, parts of the eye, individual strands of hair, and other small objects and shadows in the scene. I then sign and spray my drawing. The drawing is finally done and I can spray it after I sign the work. I start by laying out the drawing of Rudy and Vera with vine charcoal. This initial drawing will act as my guide for the rest of the drawing. This was drawn from a photo of the two models posing. I continue adding specular reflections in the background and more detail including details in the fabric of the drape on the couch and to the two figures. delicate pu’ erh or a nice oolong. Tea is indispensable to his art process!